This page is a guide for international players who want to learn how to safely deposit and withdraw money at online blackjack sites to play 21 for real money. For Australians, this guide is not applicable as online gambling is currently prohibited under the Interactive Gambling Amendment Act 2016, which went into legal effect as of September 2017. The most important factor when paying for goods and services via the Web is to make sure you are doing so via a secure website and via a reputable source/method – those which utilise Secure Socket Layer (SSL) digital encryption technology to protect our transactions. So when you wish to play online blackjack for real money, be aware of how and where you are depositing your hard-earned cash. The following licensed and regulated online blackjack casinos all maintain the high online gambling industry standards set by independent gaming governing bodies and testing agencies, and are legally accessible to all Australian residents. Having deposited and withdrawn our own money at these sites, we can vouch for their safety and privacy. Each of the above sites are compatible with all desktops, laptops, smartphones and tablets, with real money blackjack games accessible directly via our Web browsers. Follow our links above to take advantage of some incredible welcome bonuses. The most trusted ways to deposit money into an online account (and withdraw it) include credit and debit cards, e-wallets which act as a type of middle-man between your bank account and the website you are purchasing services from pre-paid vouchers and cards which often do not require and personal information, and direct bank/wire transfers. Here we detail all the above methods, confirm their compatibility with multiple currencies, and explain how to use them to fund and withdraw money to and from the online blackjack site you choose to play at. 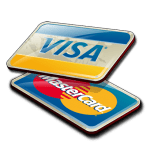 MasterCard and Visa – the two most common credit and debit cards used worldwide, support safe online transactions at each of the above online casinos. Access the cashier/banking section of your casino account. Choose credit/debit card as your method of deposit. Input your card details (name, number, CVC number and expiry date) – you only need to do this once, and then the card is registered. Input the desired amount you wish to deposit. Pending approval, your funds will be instantly available in your account ready for you to bet on blackjack games. In order to withdraw funds, follow the same process but this time request a withdrawal instead of a deposit. You’ll be asked to verify your identification by sending some form of documentation (such as a copy of your driver’s license, a utility bill (gas, electric, phone etcetera), or a scanned copy of the card you are using, with the middle number blanked out. This is to ensure you are in fact the individual requesting the withdrawal. You also need only to verify your ID once when using the same method to take out funds. Withdrawals are typically processed between 24-72 hours. Also known as Web-wallets, e-wallets are a secure online platform to store your money until you wish to use it. E-wallet sites compatible with deposits and withdrawals to and from blackjack sites include Skrill, Neteller, ecoPayz, ClickandBuy and EZIPay. Unfortunately, PayPal is not a banking option supported at this time by any regulated online casino site, but we will let you know if this changes any time soon. In order to transfer cash back and forth from a Web-wallet to other destinations, you’ll first need to set up an e-wallet account. We recommend either Skrill or Neteller, as these two methods are often subject to exclusive bonuses when used to deposit cash in to your casino account. One you’ve registered an account, you can deposit funds via credit/debit card or instant bank transfer – this account and your personal details are kept separate from any other site you choose to send money to from your e-wallet. You’ll have registered an email address when signing up your e-wallet account, and this is the sole piece of information required to deposit and withdraw money to and from the real money blackjack site. One of the best aspects of a Web-wallet is the ability to use it for countless other payments and accepting payments, aside from online gambling, all with only an email address. Use Skrill or Neteller to fund your Royal Vegas Casino account and receive a 10% deposit bonus. Instant wire transfers can be conducted one of several ways. If you wish to deposit money direct from your online banking account page, you’ll need to access the banking page of your casino account and confirm the bank details and references which will be displayed to you. Then, follow the on-screen instructions carefully to complete the transaction. Secure and effective, this type of deposit can take between two to five working days to be processed, so if you’re after an instant deposit, we don’t recommend this option. Other bank transfer options include POLi (for Australian residents only) and Citadel Direct; two platforms which work directly with your online banking account to securely transfer money to your chosen location. Funds are available instantly when using these Internet banking payment methods, so they are a much superior choice than a traditional bank transfer. Depending on the casino you are gambling with, you may or may not be able tor request a withdrawal via Citadel Direct or POLi, so double check on the cashier page, or ask live customer support if you’re still unsure. Pre-paid vouchers and debit cards are very useful for depositing money to an online blackjack site, especially if you wish to minimise the personal information you share with another company. PaySafeCard (now incorporating Ukash) and EntroPay Virtual Visa Card are two popular pre-paid banking methods compatible with our endorsed online gambling sites. Australians can purchase the cards/vouchers at sales outlets across all states within the country, especially in built-up areas such as main cities and large towns. All that is required from the individual is to hand over a desired amount of cash in exchange for the card or voucher. That amount of money is manually deposited on to the card/voucher and you receive a code printed on it. When you sign in to your casino account, access the cashier section, choose the pre-paid card you purchased as your preferred method and enter this code in the appropriate area. The funds will be instantly available so you can play random number generated or live dealer blackjack. Note that PaySafeCard’s are disposable, so they can’t be used as a means to withdraw money – after being used once, they are no longer valuable. The EntroPay Virtual Visa Card is however reusable, but you don’t have to link it to a bank account until you wish to take the money off the card. It works the same way as the other vouchers, but you can continue to transfer money to and from it after the initial cash exchange. Minimum and maximum deposit and withdrawal amounts will be on display at each individual site (every site has differing limitations), so check to confirm before completing a transaction. Live customer chat support is available at each of our recommended sites, with most operating 24 hours a day, seven days a week – if you have an inquiry about anything banking related, don’t hesitate to ask the friendly and helpful staff members. 2013 - 2017 BlackjackTips.com.au. All rights reserved 18+ Gamble responsibly.